Gardening is a wonderfully rewarding, enjoyable and satisfying past time. However, it can at times seem a bit confusing, overwhelming or even a bit scary. This course helps you to get the most out of your gardening by providing clear information and guidance about the essential things you need to know. If you're a novice gardener who likes learning with a group of like-minded people this is a good place to start your gardening journey. This field is full of gorgeous-looking soil. This frog looks very at home sitting by his pond. 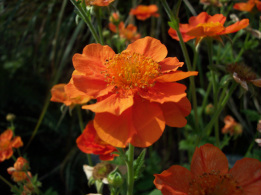 This lovely Geum is easy to care for - it just likes a sunny spot. The course uses a combination of talks, slideshows, group work, games, garden tours and practical exercises, with the choice of methods depending on the venue, the time of year and the weather conditions. Assessing and understanding your site. Understanding and taking care of your soil. Understanding different types of plants and what they need to grow well. What to do when in your garden.